It’s not just a lofty goal; it’s what our employees say, over and over, at all levels of the organization. At HGA you’ll find a company that supports your professional growth and workday happiness. A culture that embraces innovation and collaboration. And smart, respectful coworkers who set the bar high, motivating and inspiring each other. As an employee-owned firm, our people are vested and invested in our success. We invite you to find out why people think HGA is a great place to work. HGA is a national multidisciplinary design firm rooted in architecture and engineering. We believe that the best design results from deep insight into the people and passions that animate each unique environment. More than 850 people in 11 offices from coast to coast work to make a positive, lasting impact for clients in healthcare, arts and culture, community, corporate, education, government, and energy markets. From a basement office shared by our three founders in 1954, we have grown and expanded into 11 national offices with more than 850 employees. Multidisciplinary teams collaborate across the company to deliver local and sector-specific expertise backed by the resources of a national company. 84 West Santa Clara St. Competitive salaries; training and certification; mentorships; goal setting and continuous feedback; flexible project and program opportunities to broaden your expertise; HGA University; informal Lunch and Learns; tuition reimbursement program; path to shareholder status. Free coffee and tea bar; Fresh Fruit Mondays to Bagel Fridays; firm-wide social events; monthly wellness opportunities; paid holidays. Competitive insurance package; employer-sponsored HSA; wellness and fitness benefits; a full calendar of wellbeing initiatives. Retirement program; financial planning; life and disability benefits. We offer a 10-12 week paid internship program for undergraduate and graduate students (relocating stipend available). 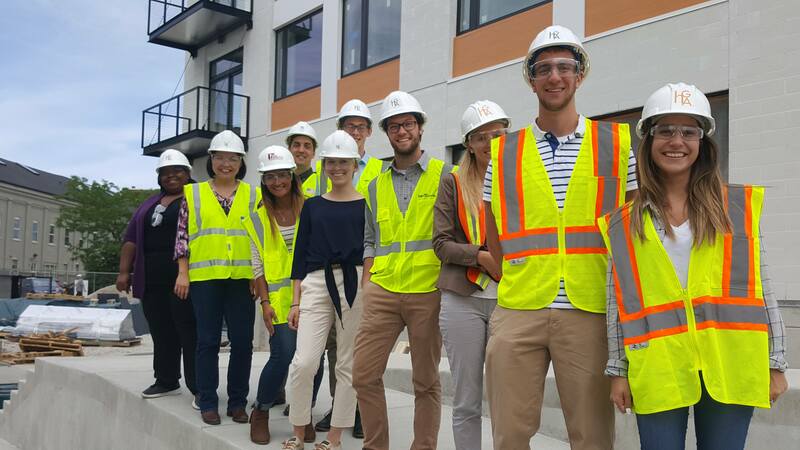 Interns in each of our offices will gain hands-on experience in an integrated architecture and engineering environment. We’ll keep you caffeinated and challenged. You’ll put on a hard hat and visit project sites. Participate in design meetings. Use innovative technology. Contribute ideas. Network with HGA employees in a variety of disciplines. In short, you’ll have fun while doing real work at a nationally recognized, multidisciplinary design firm. HGA was founded on the concept that diversity—of thought, experience, and discipline—is integral to great design. Over time, HGA’s definition of diversity has evolved to be inclusive of people of different cultural background, race, gender, religion and sexual orientation. Our success in our practices and our business depends on the diversity of thought cultivated through a culture of inclusivity.